Astronaut shares lit-up pic of India; turns out, it was not of Diwali – again! Most of the pollution-related deaths — 92 per cent — were reported in low and middle income countries, and in rapidly industrialising nations such as India, China, Pakistan, Bangladesh, Madagascar and Kenya, the study said. China, with 1.8 million pollution-linked deaths in 2015, followed India on The Lancet list. Most of these deaths were due to non-communicable diseases caused by pollution, such as heart disease, stroke, lung cancer and chronic obstructive pulmonary disease (COPD), according to The Lancet Commission on Pollution and Health’s study. The study is part of a two-year project that involved more than 40 international health and environmental authors led by Philip Landrigan, an environmental scientist, and Richard Fuller, founder of NGO Pure Earth, and the secretariat of the Global Alliance on Health and Pollution. Among the authors of the study are former environment minister Jairam Ramesh and IIT-Delhi’s Prof Mukesh Khare. According to The Lancet report, air pollution was the biggest contributor, linked to 6.5 million deaths in 2015, ahead of water pollution (1.8 million) and workplace-related pollution (0.8 million). Of the 2.51 million deaths in India, 1.81 were related to air pollution, 0.64 million to water pollution, 0.17 million to occupational exposure and 95,000 linked to lead pollution, according to the study. 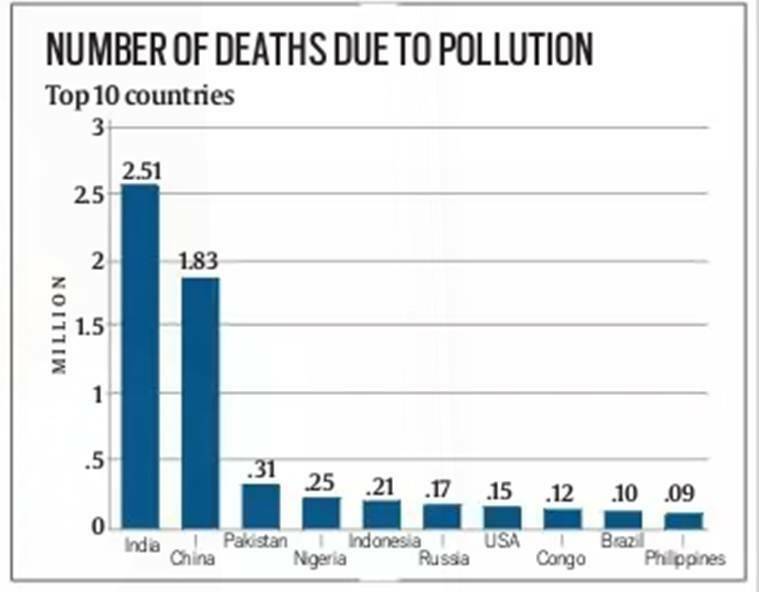 China (1.58 million) was placed after India in deaths linked to air-pollution, followed by Pakistan (0.22 million), Bangladesh (0.21 million) and Russia (0.14 million). In deaths linked to water pollution, Nigeria (0.16 million) and Pakistan (74,000) were placed after India. Speaking to The Indian Express, Dr Sundeep Salvi, a member of the Health Ministry’s steering committee on air pollution and health, described the findings as “major” and said that it was “time to wake up” and start finding innovative solutions. “For this, the government will need to take a lead role and formulate strategies on an urgent basis. Otherwise, the growing economy in the country will be a curse to the common man because this is coming at the cost of suffering and death,” Salvi said. For the study, researchers used data from the Global Burden of Disease study, which brings together comprehensive estimates on the effects of pollution on health, provides economic costs, and reveals the extent of contaminated sites across the world for the first time. The aim of the Lancet Commission is to raise global awareness on pollution, end neglect of pollution-related diseases, and mobilise resources and political will to effectively confront pollution, according to its co-lead, Prof Philip Landrigan from the Icahn School of Medicine at Mt Sinai, US.